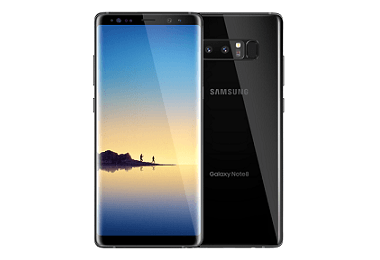 Latest price of Samsung Galaxy Note 8 in India was fetched online from Flipkart, Amazon, Snapdeal, Shopclues and Tata Cliq. "Samsung Galaxy Note 8 Gets another Price Cut of Rs. 13,000 in India: Now Priced at Rs. 42,900"
The long-awaited Galaxy Note 8 is finally here. Announced in the month of August this year, the phablet is now available in India. It is the biggest smartphone that Samsung makes and is equipped with features that justify its expensive price tag. Especially with the disastrous double-recall of Note 7 last year due to the fault in their batteries, the Galaxy Note lovers have bigger expectations from this latest smartphone from Samsung, and hopefully, it won’t disappoint the buyers. The Samsung Galaxy Note 8 is a 162.5 x 74.8 x 8.6mm smartphone which boasts a 6.3-inch AMOLED infinity display. It has a display resolution of 1440 x 2960 pixels in 18.5:9 ratio with 16M colours and ~521 PPI density. The phone comes with an improved S Pen which can be used for the live message, writing Samsung Notes without unlocking the phone, creating GIFs, magnify, translate, glance and do a lot more. The phablet features a dual 12MP rear camera with a ½.55” sensor and features like autofocus, dual LED flash, 2x optical zoom, geo-tagging, panorama, Auto HDR, smile/face detection, touch focus and simultaneous video and image recording. On the front, it features an 8MP 1/3.6” sensor camera for shooting beautiful selfies. The phone has a 3.5mm jack and a USB 3.1 port for enhanced connectivity. It has a hybrid SIM slot and can be used with a Nano SIM. The phone comes with a host of connectivity options like Bluetooth, Wi-Fi, GPS, Headphones, USB OTG, NFC, 4G and 3G networks. It also has Compass Magnetometer, Iris Scanner, Fingerprint Scanner, Accelerometer, Proximity Sensor, Barometer, Gyroscope, Ambient Light Sensor, and Barometer. Samsung Galaxy Note 8 is powered by an all-new 1.7GHz octa-core Exynos 9 Octa 8895 processor and has a 6GB RAM which is a significant upgrade from Galaxy S8+ which has a 4GB RAM. It uses the Mali-G71 MP20 GPU to offer a better visual experience. It has an internal storage of 64GB which can be expanded up to 256GB with a microSD card. Galaxy Note 8 runs on Android 7.1.1 and uses a non-removable Li-ion 3300mAh battery which is smaller than the 3500mAh battery used in Galaxy Note 7. Apart from reducing the battery size, Samsung has also increased the testing of its smartphones to avoid last years mistake in future. On a full charge, the battery can deliver up to 22 hours of talk time on a 3G network and audio play of up to 74 hours. Just like its S8 series of smartphones, Galaxy Note 8 also supports the new Samsung Pay feature for MST and NFC terminals for cardless payments. The phone also comes with a host of pre-installed apps like App Store from Samsung Galaxy, Microsoft Office, etc. Samsung has also improved the Bixby Voice Assistant which you can activate with a simple swipe to the right on the home screen. There is also a dedicated button for Bixby on the left side of the device. With an Indian version of Bixby now available, the voice assistant is a great way to use your Galaxy Note 8. •	Great build and design- The curvaceous build of Note 8 look aesthetic and appealing. If you are looking for a smartphone with an edgy design, this certainly is a phone that you should consider. •	Impressive display- The 6.3-inch infinity display of Note 8 is what sets it apart from other top of the line smartphones. You get Super AMOLED and quad-HD resolution for perfect blacks and bright colours. •	Competition beating dual cameras- The phone features dual 12MP rear camera which offers 2X optical zoom. Unlike many other dual real camera phones, Note 8 offers optical image stabilisation on both the lenses for steadier videos and images. •	Mighty S-Pen- The S-Pen has returned to Note 8 with a host of great features. Be it creating animated GIFs or writing an off-screen memo; the S-Pen is a great tool. •	App Pair for multitasking- Note 8 comes with App Pair feature with the help of which you can use two different apps simultaneously. You can choose your pair of apps through Apps Edge. •	Location of the fingerprint sensor is awkward- While you can unlock the phone through your iris or face, the fingerprint sensor is at the back next to the camera which is a little inconvenient. •	Lack of stereo speakers- While the phablet is great for use for work as well as entertainment, it lacks stereo speakers for an immersive audio experience. •	The battery could have been better- With so much of screen space and S-Pen, Note 8 would surely consume a lot of battery power. While it has Snapdragon 635 which is known for its power efficiency, the battery could still have been a little bigger. •	Slightly heavy- The phone weighs 196 grams which according to some users is a little heavy on the hand when carrying. •	Expensive- Note 8 is not your standard smartphone with a basic set of features. It is a top of the line product with impressive features and an expensive price tag.